Text Santa has teamed up with ASDA and on Thursday 6th December 2012, volunteers will help customers bag their shopping at the checkouts. Including ITV West & Westcountry's Cordelia Lynch and Alex Beresford. You can find out about the charities that are benefitting from the Text Santa Appeal here. 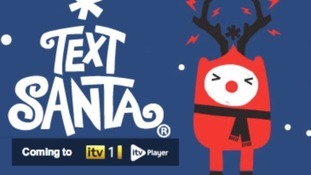 You can follow Text Santa on Twitter for the latest information about the live show and what they are doing near you. You can volunteer to help in the Biggest Bag Pack Ever at your local ASDA here.